Sunjammer, NASA’s next solar sail experiment. Though the article headline focuses on the addition of space weather instruments to this solar sail, the article says very little about those instruments. One, Swan, is described as a “wind instrument”, which probably means it would study the solar wind. The other instrument would study the Earth’s magnetic field. Both instruments are needed to track the effect of the Sun on local space weather, since the one satellite we have to do this, Ace, is now more than a decade past its expiration date. The solar sail Nanosail-D has sailed home, burning up in the atmosphere on September 17. The flight phase of the mission successfully demonstrated a deorbit capability that could potentially be used to bring down decommissioned satellites and space debris by re-entering and totally burning up in the Earth’s atmosphere. The team continues to analyze the orbital data to determine how future satellites can use this new technology. The concept being tested appears to use a solar sail as a navigating tool for guiding defunct satellites back into the atmosphere. In a paper published today on the Los Alamos astro-ph preprint website, two Chinese scientists have proposed using a solar sail for deflecting any asteroid that happens to be aimed at the earth. The diagram to the right is their simulated mission to impact the asteroid Apophis, which will pass close to the earth in 2029 and — depending on whether that flyby puts it through a very small 600 meter-wide mathematical “keyhole” — could then return in 2036 on a collision course. The idea is to use the sail to slow the spacecraft down enough so that it starts to fall towards the sun. The sail is then used to maneuver it into a retrograde orbit. When it impacts the asteroid the impact will therefore be similar to a head-on collision, thereby imputing the most energy in the least amount of time with the least amount of rocket fuel. 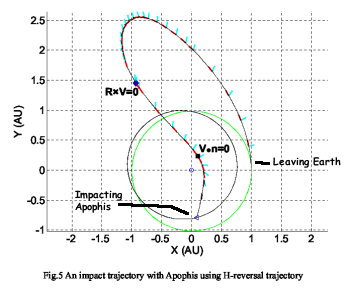 In their Apophis simulation, a mission, weighing only 10 kilograms (about 22 pounds), launched around 2025, and hitting the asteroid in this manner in 2026, would deflect its flyby in 2029 enough to guarantee it will not fly through the “keyhole” and therefore eliminate any chance of it hitting the earth in 2036. Obviously many questions must be answered before such a mission should fly. An amateur astronomer has grabbed some spectacular images of solar sail Nanosail-D.